I purchased a low noise product for indoor use. Certainly it was quiet and hopeful. Because I put a radio in the rack, I really wanted a quiet fan. This review is about item#37651311. Although it is not in the newest iMac, it uses a type with a slit that allows air from the cooling fan to escape. The power supply base is contained on the part from the right side as seen from the screen side. I will use this product as a cooling fan as that part becomes the most hot. Attach it so that it hangs using the stainless steel perforated stay. Why, say 200V product or 100V product as it is for household use 100V When used it produces quite a sound even at low speed products. 200 V power supply and 100 V power supply. This reduces the number of revolutions and makes the noise less likely to occur. I am actually using it now, but I can hardly hear the sound of the fans. The sound of the air condition dominates the noise of this room. 100V use of 200V fans has many actual results in other places. If it says that it is good if the air flows, it is usage that applies to everything. This review is about item#37651302. It is used for ventilation inside the sink of the kitchen, but it will be broken in about two years. Although I bought this product, but from the Oriental motor etc. to the air flow rate Rotating sound is noisy. I wonder if the price is different. This review is about item#37651293. The sound is also quiet, orders come out at any time, and we are very satisfied with shipping items as soon as possible. The sound is also quiet and can be ordered alone, shipping is also fast and I am very satisfied. I was looking for a mismatch of the one I used before for the soundproof room and it reached this. However, the noise was bigger than the one I used before, so I did not use it after all. Looking at the specifications, there was not much difference in noise, but it was surprisingly big when used, and it was not useful for speech recording. Although it may not be a problem in the factory etc., since it is used indoors, next time I will buy a fan with super quietness. Noise like bearings grounder is big 2 points. 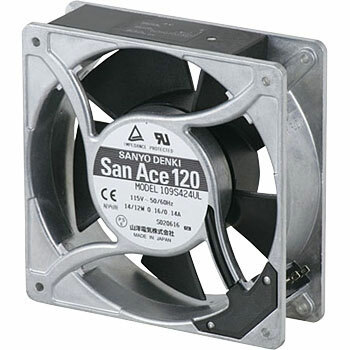 Because it is used like a small ventilation fan, I can stand it, but it is noise that many people feel unhappy in case of using purpose such as cooling equipment. Normal type is strong and low type is weak, and I tried both, and personally, I felt so if there was a gap. It is used for cooling electrical parts. Cooling effect is sufficient with sufficient air volume, operation noise is not bothersome. It is satisfactory enough. This review is about item#35102365. More than 10 years ago, I replaced the AC fan that was attached to the equipment I had purchased because it was out of noise (noise). Since the mounting screw hole was small, it was replaceable without any problem except it spread to 4 mm. (It was not that much load to spread the screw hole.) Since the same AC fan is attached to the same equipment, we are considering replacing it at this time. This review is about item#08584152. There was a thing of the same type, so it was possible to install without problems. This review is about item#08584116. By exchanging the fans that were originally attached, there was exactly the same thing so I ordered it immediately. Mounting holes pass 3 mm screws, but 4 mm screws do not pass. The fan which was originally attached was slightly struggled because 4 milliseconds was used. I was lost as to whether to tap a hole or fix with a tapping screw, but in the end I chose to drill a hole with a 4 mm drill. Since the frame itself was aluminum, the processing itself was easily expandable with ordinary iron drills. There is no problem with the silence and power of the fan, and it works smoothly. I think it is a very good product. This review is about item#08584161. Since detailed data was verified on the net before purchase, satisfactory fans could be purchased. In the store I got acquainted last year, wind noise is large because of few products, so I replaced it this time. Thanks to that, I finished it as a convincing one. The price was also cheap, the fans reached quickly and above all, and it was able to improve in a short period of time. I am very satisfied with silent design. The item arrived the next day after the ordering date and it was saved. About 10 years passed after the installation of the equipment, since the power supply part was broken at the plug cord connecting part, it was in a state where ventilation inside the control panel was impossible, so I exchanged it. If the condition that can not be ventilated continues for a long period of time, it causes a failure of PLC etc. This review is about item#08584143. Although I was using several units from the past, one unit was broken and I searched MonthaRO this time and ordered immediately. The next day I am satisfied very much. This review is about item#08584134. If you would like to ask only one sturdy and long-lasting thing, I would like you to sell it with a plug cord and set.